Our sail from Eleuthera back to the Exuma Islands was more and less exciting than we expected. We anticipated an easy spinnaker sail but the wind was shifty and we ended up changing sails two or three times. So that was a little “more” than we expected. Spinnaker sailing is probably my favorite! On the other hand, Frank diligently employed the fishing techniques Paul, our Eleuthera guide, had taught him, but our only bite was a barracuda. So the fishing was “less” exciting than we had anticipated. The fun news is that we were able to raise s/v Radiance on the VHF and made plans to meet at an anchorage on Compass Cay. Surprisingly they ended up entering Conch Cut, an entrance from the Bahama Sound into the Exuma Islands, at the same time we did! So we followed them through the cut and we anchored right next to each other. We shared sundowners that evening and plotted activities for the next few days. S/V Radiance only had a few days before they were off to Nassau to pick up guests so we wanted to pack in a lot during our days together. Susan had saved some “bubbly” to share and we managed to consume all of it… waste not, want not! The first day together, we packed into our dinghy, Day Tripper, and headed to the marina where we could swim with the nurse sharks then hike on Compass Cay. We trekked from the marina all the way to the Bubbly Bath at the north end of the island. Frank, Susan and Kevin on Compass Cay. At five miles round trip, the walk was a bit longer than we anticipated, but the views along the way were great. Frank “dunks” a rock at Hester’s Gym, an abandoned bar on along the walk. The Bubbly Bath was a fun place to hang out in the shallow water and enjoy the waves as they broke over the rocky ledge that separated us from the ocean. We agreed that this was a place we wanted to revisit! Susan is making a beeline for the Bubbly Bath at the right end of this picture. When we returned to the marina, Kevin and Captain found a breezy, shady spot to cool down and Susan and I watched Frank swim with the sharks. Unfortunately my camera battery died so I don’t have pictures. Next we moved the boats to Cambridge Cay which is the southern most part of the Exuma Land and Sea Park. We grabbed mooring balls and were delighted when we realized that s/v Tatiana was on the very next mooring ball! I think these fish were looking for nibbles. Sorry for the picture quality, I don’t have my red filter yet! There was only one other dinghy at the snorkel site and they were just about to leave when we arrived. I was busy getting out gear when I heard, “Frank? !” HA! The folks in the other dinghy had shared our dock in Annapolis during our last few weeks at Jabin’s Yacht Yard! Art and Celeste were doing some refit work on their catamaran in Annapolis and we knew they were headed to the Bahamas, but we were surprised to run into them! What a small world! Susan and I decided we really needed a second visit to the Bubbly Bath, so we invited s/v Tatiana to join us. We packed a cooler and some floats plus our snorkel gear. The six of us, and Captain, took off in Day Tripper and stopped at the Rocky Dundas snorkel site. We swam into the caves and poked about checking out the coral and sea life. Kristen, James, Frank, Kevin and Susan…. Cap and I are in charge of pics. After an arduous snorkel (not) we really needed to relax, so the Bubbly Bath was next up. It’s important to have plenty of toys and snacks! Cappy divided her time between a shady hole in the sand and my lap in the water. We had a great time floating about, sharing drinks and stories as we watched the waves begin building and breaching the rocky surroundings. What a fun way to while away an afternoon! It was great fun meeting up with Susan and Kevin again and we enjoyed several days together exploring Compass Cay and Cambridge Cay. 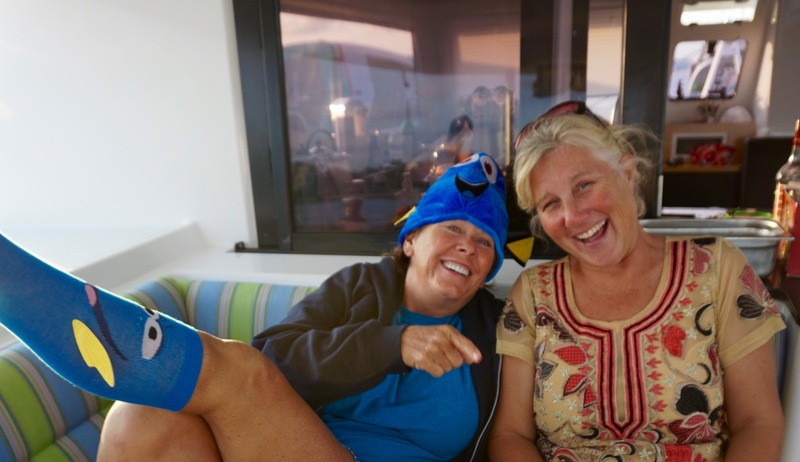 Although we were only together about 4 days we managed to hike, snorkel, share dinner aboard both boats, gather at an anchorage beach sundowner event, listen to Kevin and a new Canadian friend jam on guitars and float about in the Bubbly Bath twice. We were sad to see s/v Radiance leave head north, but we have plans to meet again very soon! Sundown after an afternoon of kiting. My kiting on the other hand seems to go two steps forward and three steps backwards. Some days I am comfortable and don’t need any support, but other days I am very happy to have Frank “on watch” to help me if I become discombobulated! After s/v Radiance and s/v Tatiana departed, Frank spent the next week or so exploring Black Point and Pipe Cay, then returning to Cambridge Cay. We resumed our usual activities of hikes, biking, swimming and general dinghy exploring. Instead of boring you with details, here are some pictures. The anchorage at Black Point. Regardless of location, all little kids love to play with smart phones! Probably the most beautiful spot we have seen; Pipe Cay. Hiking along a rocky ledge. A small private island. They seem to have a few extra comforts available! Who needs a Hallmark Valentine’s Day card? Thanks so much for reading about our journey. Let us know if you are nearby! Next up – George Town; cruisers central in the Bahamas!